Here’s a basic, hearty and delicious, quick and easy meatloaf recipe that you’ll absolutely love. With just a few basic ingredients and easy steps you can make a savory meatloaf that’s perfect for a quick weeknight meal. Meatloaf is a meal that everyone loves and it doesn’t have to be a big deal to make at all. The basic ingredients of meatloaf are ground beef, egg and breadcrumbs. 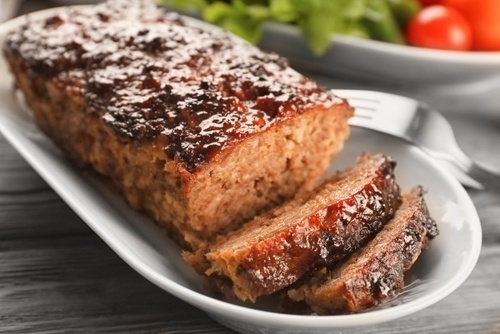 By adding some chopped onion, mustard, ketchup and salt and pepper, and a little brown sugar, you’ve made a quick and easy meatloaf that is simply outstanding. This meatloaf recipe is plenty for two people with some leftovers that are great the next day and heat up easily in the microwave. Or even put the leftovers on a couple of pieces of toast for a delicious meatloaf sandwich. 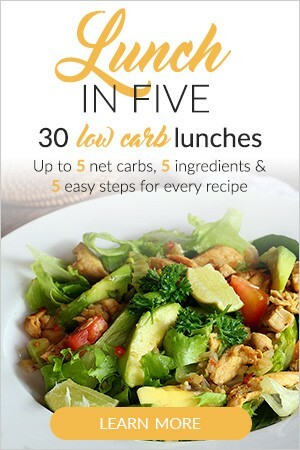 Kids love helping to make this recipe too! 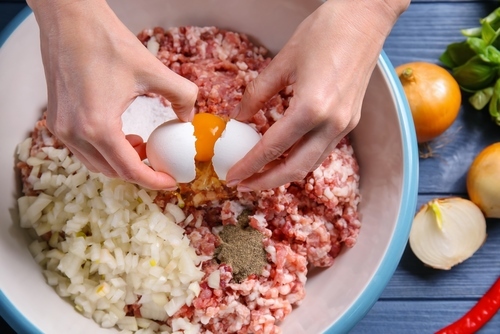 In large bowl, mix ground beef, breadcrumbs, onion, milk, egg, salt and pepper. Use two hands and mix well. In a separate small bowl, mix ketchup, mustard and brown sugar. Lightly grease a shallow baking pan (13x9 is ideal), and shape beef mixture into a loaf. Cover with ketchup mixture and bake in oven for 45-55 minutes. Check with instant read thermometer. Internal temperature should be 160 degree F.
This is so quick and easy and my wife complimented me on my cooking skills. I did follow other people’s advice and lined the tin with bacon and put boiled eggs in the centre. Can’t wait for the grandchildren to come and help me make it again. I’ve made this so many times. My family LOVES it! I doubled it for a family dinner last night and I got a ton of compliments! Thank you for sharing such a delicious dish! This was super easy, but next time I will add some Italian seasoning and maybe garlic?? It was a little bland. I added some onion powder, and garlic & herb spice. Was much better. I do that everytime and my family loves it. I substitute chopped bread n oatmeal to breadcrumbs. Add 1 egg n make 1/2 milk ~1 cup.it smell so so good n taste good. Moist. This is easy and so good. I goofed the first time and mixed the ketchup top seasoning into meatloaf, then more on top. Hubby loved the mix up, but now I leave the milk out. I love how easy this is. I add mozzarella cheese in the center like my mom does an its so good. An all the kids love it. This is my favorite meatloaf recipe. The only thing I do different is sometimes I add gr. pork with the gr.beef. like 3 parts beef to 1 part pork. This is, hands down, the best meatloaf I’ve ever had. Made for us by a caretaker of our elderly family members. She had never made it before and the raves were so positive she tried a second time with equal success. A hint of sweet and sour with nothing more than ketchup, mustard, and brown sugar. I used Italian style breadcrumbs. I added garlic powder and crushed red pepper. In the topping, instead of 1/3 cup ketchup, I combined a 1:1 ratio of ketchup and tomato sauce in the required 1/3 cup. Also I put in a dash of cholula hot sauce in topping. It was an easy recipe to follow. Love the topping, but the taste of the meatloaf was a tad bland. I will use the recipe again, and try to flavor it a little more. My Mom used to add tomato paste or sauce to the meat mixture. This is an easy recipe to follow. I love it. I fix it every time, I stop fixing my old recipe for meatloaf. I am fixing it today. How many people ideally is this for?